Birmingham Wasp Control is a specialist wasp nest treatment service covering Birmingham, Wolverhampton and West Midlands areas. Wasp nest removal and treatment service only £45.00 fixed price no extra, 100% guarantee with no hidden extras or nasty surprises, same day service. Birmingham Wasp Control are the premier wasp nest treatment and wasp nest removal company in Birmingham, we cover Birmingham, Wolverhampton and West Midlands areas. 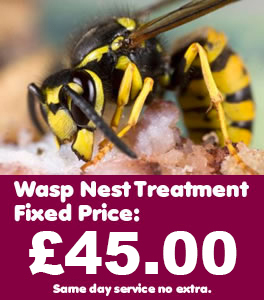 We are experts for wasp nest treatments in Birmingham. 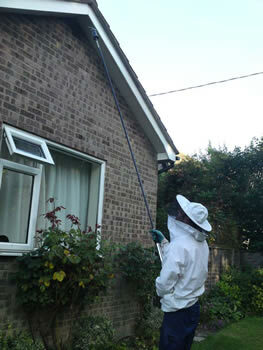 Birmingham Wasp Control service covers Birmingham, Wolverhampton and West Midlands. Our services are 100% guaranteed and our reputation precedes us. Birmingham Wasp Control offers a sameday wasp nest treatment service at a fixed price of £45.00 no hidden extras, therefore no nasty surprises when we attend your home or place of work. For domestic and commercial wasp removal and wasp nest treatment service for Birmingham, West Midlands and Wolverhampton. We treat wasp in all types properties, wether you have a wasp nest in your loft, your shed or in your garden, Birmingham Wasp controll can treat your problem. 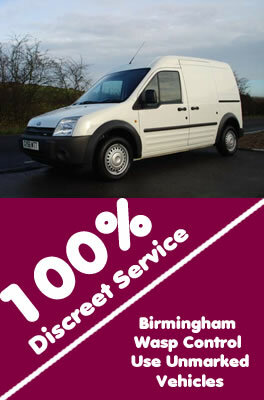 We offer a same day service with no extra change for weekends or bank holidays. We don't cover Bumble Bees Removal, please note that there will be a call out charge for finding Bumble Bees instead of Wasps. Remember if you're unsure... Just ask us! Wasps live in nests that are usually found in roof space, airbricks, cavity walls, garden sheds, trees and even in flowerbeds. Birmingham Wasp Control treat all wasp nest problems. The nest is ingeniously made from dried timber primarily and is held together from the saliva of the wasp. The nest is usually grey or beige in colour and can be up to a metre in circumference towards the end of it’s construction – normally by the end of the summer months. Birmingham Wasp Control treat all wasp nest problems. A typical nest is home to 5000 - 10000 wasps! It used to be the case that new nests were found in late spring but because of the current weather conditions (climate change), we are finding nests being formed a lot earlier due to the climate changes in Birmingham, Wolverhampton and West Midlands! Is it normal to see large wasps in early spring? If you see wasps in early spring and they appear to be large in size then this is because they are queen wasps that have ‘overwintered’. This happens in late winter due to the warm weather – again caused by climate change. You can recognize the queen wasps as they tend to group together and are larger in size than normal wasps. Wasps are aggressive creatures by nature and will sting when disturbed without question. Wasps do not care who or which animal they sting and often sting for no reason. Please call for professional help to save being stung. Contact Birmingham Wasp Control on 0121 450 97840121 450 9784 if you require any assistance on wasp nest treatment or removal in Birmingham, Wolverhampton and West Midlands. We provide wasp nest treatment to both residential and domestic clients, housing associations, letting agents, landlords, offices, shop premises, restaurants, warehouses and all commercial properties. Ring us now on 0121 450 97840121 450 9784 and speak to the premier wasp nest treatment and control experts now for a SAME DAY SERVICE in Birmingham, Wolverhampton and West Midlands! We cover the following post codes: Birmingham B1, B2, B3, B4, B5 4, B5 5, B5 6, B5 7, B6 4, B7 4, B7 5, B9 4, B9 7, B10 0, B12 0, B15 1, B15 2, B15 3, B16 8, B16 9, B17 0, B18 5, B18 6, B19 3. Wolverhampton post codes: WV1, WV10, WV11, WV12, WV13, WV14, WV15, WV16, WV2, WV3, WV4, WV5, WV6, WV7, WV8, WV9.